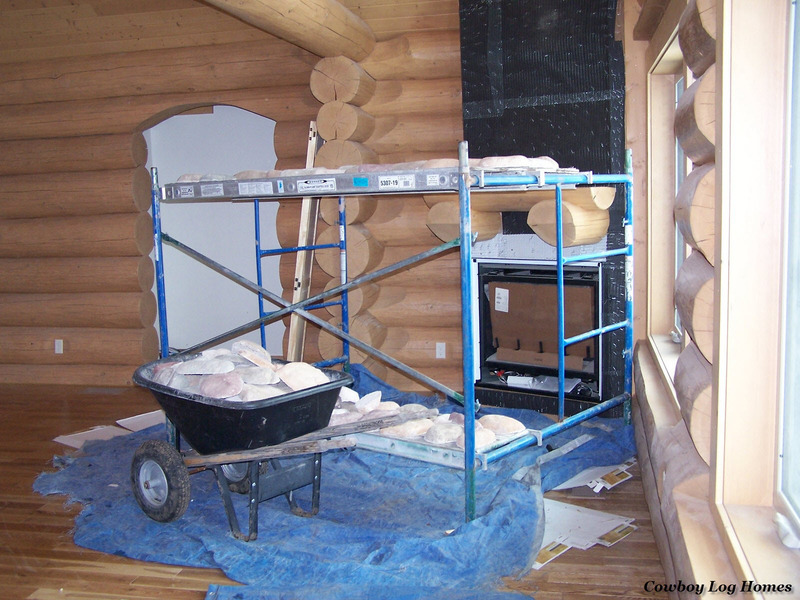 One of the last stages finishing this handcrafted log home is the stone fireplace. 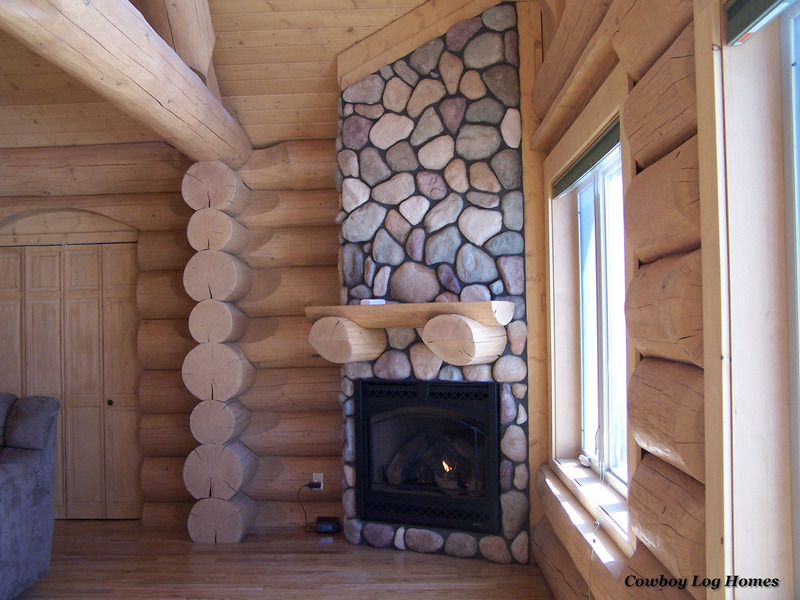 Fireplaces are a staple of log homes of every sort. For this specific plan the owners located the fireplace in the front corner of the great room. 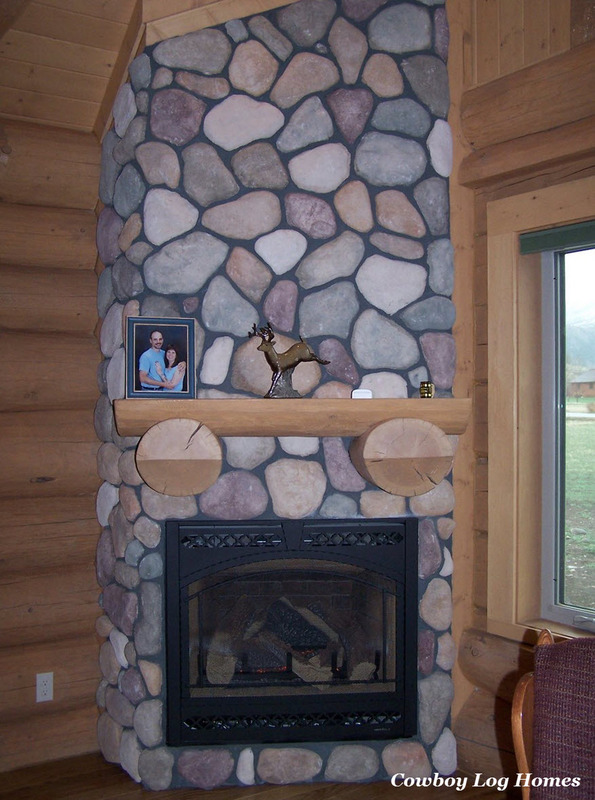 The stonework is a cultured river rock stone and is the same as what was used on the outside of the log home. First the fireplace was framed in around. Then the natural gas burning fireplace insert was installed and the chimney pipe. The sheathing was covered with a vapor barrier and lathe and the edges of the fireplace area has been finished with wood trim. We can also see the matching log mantel has been set into place. The next step is to bring the cultured stone into the home and sort it. Since the wood flooring is all installed cardboard and tarps have been laid to protect the floor. Any time rock is being installed it is a good idea to layout the stones and randomize the color scheme and rock sizes. After only 2 days all the rock is has been hung and grouted around. The fireplace installer will return and finish the fireplace unit installation. Since natural gas is not available in the subdivision the orpheses (sp??) have been changed over for propane (LP) gas. The perspective of this photo shows the unique angle of this fireplace. Notice especially the top where this floor to ceiling log fireplace penetrates to the roof. There are actually four angles flowing together to make this corner fireplace. By locating this fireplace in the corner not a lot of floor space was lost. The size of this stone fireplace feels in proportion to this log home. Some fireplaces are very ‘skimpy’ while others are so huge they seem to dominate the entire room. So the dimensions of the fireplace also play a role in the great room of the home.